With one foot in the green of Mississauga's parkland and the other in the bustle of Hurontario and Eglinton, Skymark West I is the place for living large. 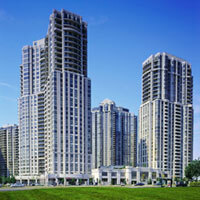 Noted for its enormously spacious suites, complete with linen closets, patios, and show-stopping views, Skymark West I wraps the best of Mississauga in peerless elegance. Just across the street from the Kingsbridge Common Park and steps away from gastropubs, groceries, and an eclectic spread of international restaurants, Skymark West I puts you minutes from the Mississauga Living Arts Centre, Mississauga Public Library, and Celebration Square and a diverse array of food, culture, and live events. Close to Highways 403, 401, 407 and the QEW, Skymark West I gets you quickly downtownâ€”and quickly out of town for a getaway via nearby Pearson International Airport.